Brownian motion is a central object of probability theory. One perspective to look at its construction uses Hilbert spaces.
. Hence, “all” we need to do is to find a Hilbert basis. The most known is the following. 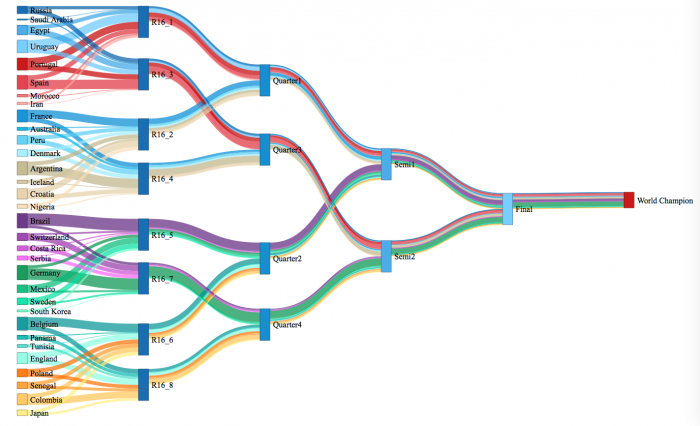 Here we refer to http://datatreker.com/haar-basis for an introduction. The result looks the same as with Levy’s construction which is not astonishing. The implementation above is not optimal and is much slower than the previous one. It might be worth to consider a different Hilbert basis. The above convergence is very slow. The irregularity properties of the Brownian motion are not yet very visible. Hilbert spaces play a prominent role in various fields of mathematics. An orthonormal basis of such a space is called a Hilbert basis. The purpose of this blog is to illustrate a very clasic and basic Hilbert basis – the Haar basis. It is pretty easy to illustrate this construction using R and the package gganimate. We use the same notation as in the proof of Wiener’s theorem given on page 23 in “Brownian motion” by Peter Mörters and Yuval Peres. Football is a typical low-scoring game and games are frequently decided through single events in the game. These events may be extraordinary individual performances, individual errors, injuries, refereeing errors or just lucky coincidences. Moreover, during a tournament there are most of the time teams and players that are in exceptional shape and have a strong influence on the outcome of the tournament. One consequence is that every now and then alleged underdogs win tournaments and reputed favorites drop out already in the group phase. The above effects are notoriously difficult to forecast. 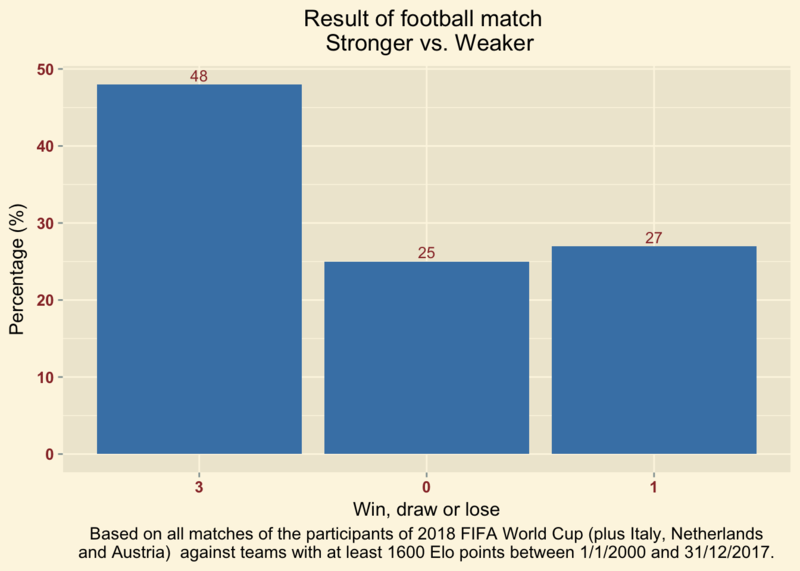 Despite this fact, every team has its strengths and weaknesses (e.g. defense and attack) and most of the results reflect the qualities of the teams. In order to model the random effects and the deterministic drift forecasts should be given in terms of probabilities. 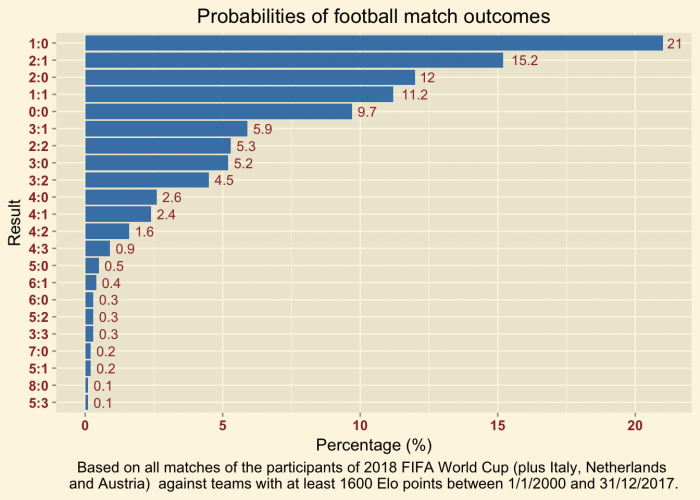 A series of statistical models have been proposed in the literature for the prediction of football outcomes. They can be divided into two broad categories. 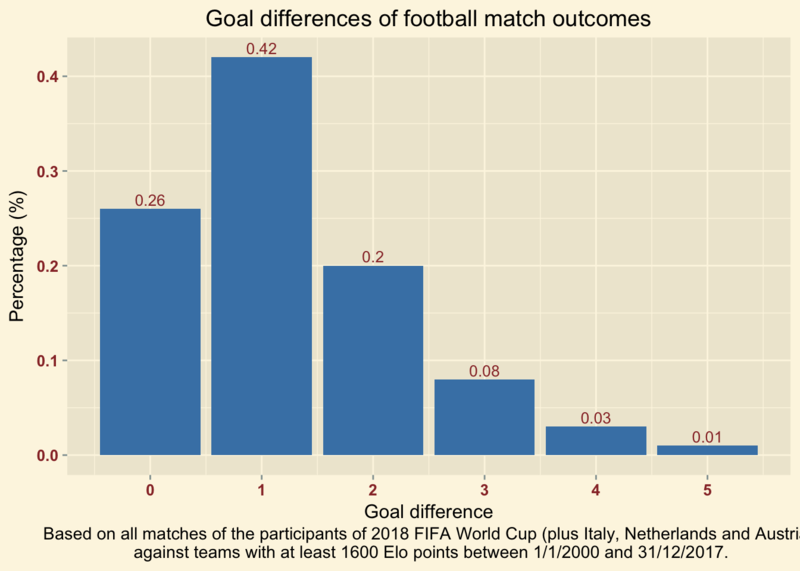 The first one, the result-based model, models directly the probability of a game outcome (win/draw/loss), while the second one, the score-based model, focusses on the match score. We want to follow the second approach since the match score is important in the group phase of the championship and it also implies a model for the first one. 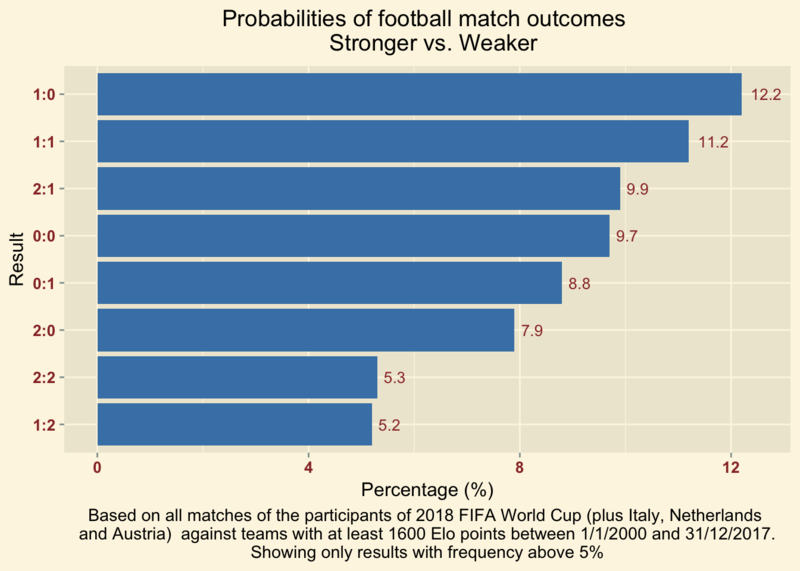 The model proposed in How to impress your football fan colleagues is a first approach but it does only give the most typical outcomes. that describes the expected number of goals. This post is dedicated to Nina, she knows why. … with zero-knowledge on football. Before and during the 2018 FIFA World Cup™ all your colleagues, friends or even family member talk about football? Who is going to win? What a surprise that team blabla lost, what do you think? Again such a close match! You do not see any way to avoid it? Impress them using the following flow chart. There are reasonable chances that your forecasts outperform the subjective and pretentious estimates of your colleagues. 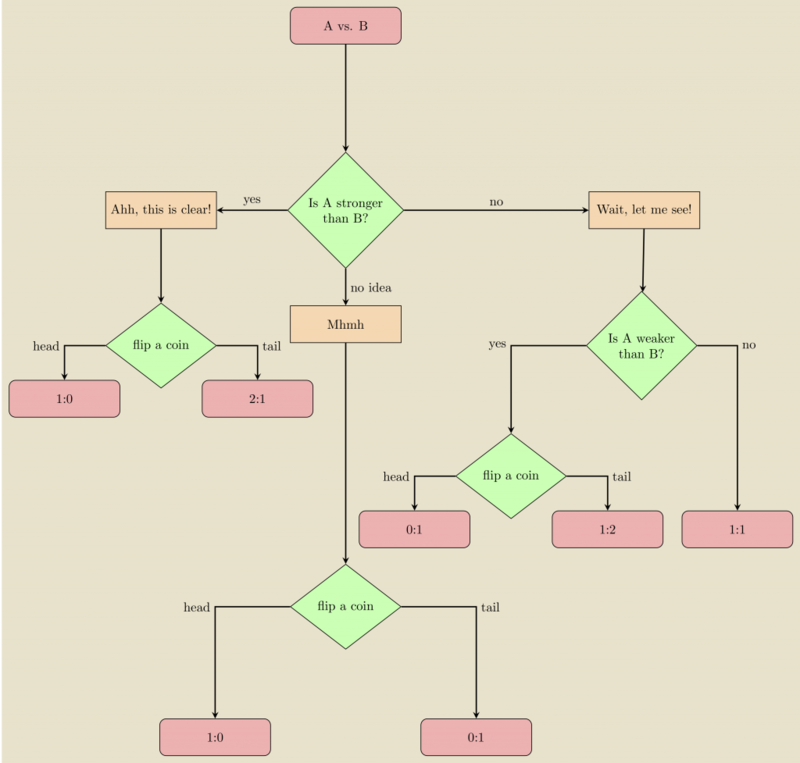 The above flowchart is based on the results obtained in What are typical football results? and What are typical football results II?. Using these data you can easily cook up more sophisticated models. For more details on this series of posts see Who wins the 2018 FIFA World Cup™?. We continue What are typical football results? The notion of weaker and stronger has not been made precise. Is is true that a team that has say 5 Elo points more than another team is really stronger? What might be an appropriate threshold? 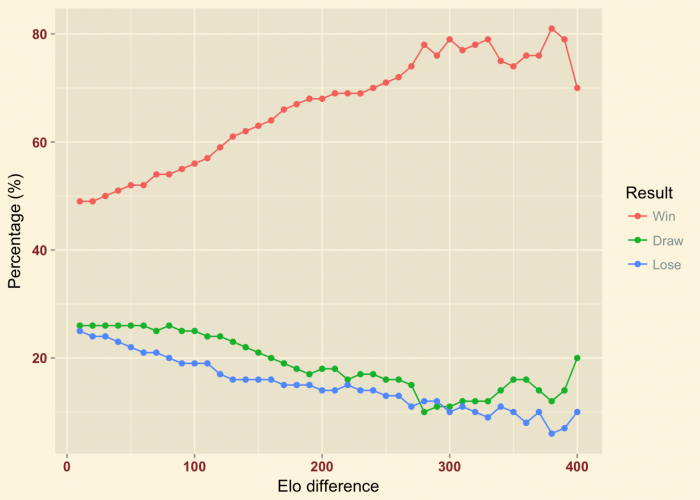 A glance at the current Elo ranking might give an indication that teams in within 50 points may be considered as equally strong. But is this true? At which threshold the probabilities of win, draw, lose will change?